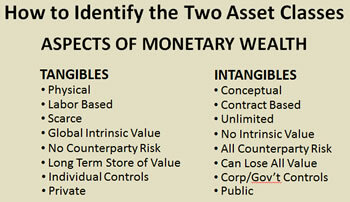 Key Difference: Tangible assets are assets that have a physical presence; they are the assets that can be touched. Intangible assets refer to assets that do not have a physical presence, i.e. they cannot be touched. In order to be successful, a company needs to have a good combination of Tangible and Intangible Assets. The two terms are often used in collaboration. 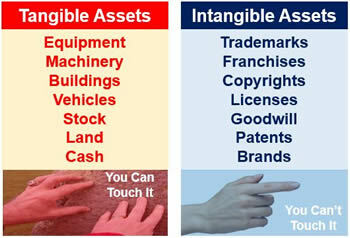 In order to understand the difference between tangible and intangible assets, one must first understand the difference between the terms tangible and intangible. Tangible refers to something that has a physical presence, i.e. it can be touched. Intangible, on the other hand, refers to things that are real but they don’t have a physical presence, i.e. they cannot be touch. For example feelings, ideas, air, moonlight; all of these things are real but you may or may not be able to see them, and you definitely cannot physically touch them. Tangible and intangible assets follow the same logic. Tangible assets are assets that have a physical presence; they are the assets that can be touched. This includes both fixed assets, such as machinery, buildings and land, and current assets, such as inventory, labor, etc. Intangible assets refer to assets that do not have a physical presence, i.e. they cannot be touched. This can include assets such as patents, trademarks, copyrights, goodwill, brand recognition, etc. Depending on the type of business, Internet domains, licensing agreements, software, blueprints, medical records, trade secrets, as well as other assets can also be counted as intangible assets. Nonphysical assets, i.e. intangible assets are in no matter less important than tangible assets, i.e. physical assets. In fact, in order to be successful, a company needs to have a good combination of Tangible and Intangible Assets. Both Tangible and Intangible Assets are important aspects of the company’s standing; hence both are included in the company’s balance sheet. As types of assets, both have the potential for future revenue and hence make an important part of the company’s portfolio. However, it should be noted that their value does decrease over their lifetime. Though, this process for tangible assets is called depreciation, whereas for intangible assets it is called as amortization. Land, vehicles, equipment, inventory, stocks, bonds and cash. Has a physical presence, i.e. can be touched. Does not have a physical presence, i.e. cannot be touched. Derive their value from intellectual or legal rights, and from the value they add to the other assets. Both market value and book value changes due to depreciation. Can be destroyed by fire, hurricane, or other disasters or accidents. Can be more readily sold to raise cash in emergencies. May be more difficult to be sold in emergencies.